A question for WHL fans: Is F Keegan Iverson, the captain of the Portland Winterhawks, the first player in WHL history to play in at least one playoff game in each of six consecutive seasons? He dressed for one game as a 15-year-old. Now finishing up his 20-year-old season, he will play in his 69th career playoff game tonight at home against the Kelowna Rockets. On Friday, Sheldon Kennedy was in Red Deer taking part in a celebrity dance off that raised around $1 million for the Sheldon Kennedy Child Advocacy Centre in Calgary and Central Alberta’s Sexual Assault Support Centre, which soon will have a child advocacy centre under its roof. . . . On Monday, Kennedy was in Winnipeg where the Manitoba government announced that the Respect in Schools program, which has been in Manitoba schools since 2011, has been renewed for three years and is to expand into First Nations and private schools. The program was developed by a group that was co-founded by Kennedy and Wayne McNeil. . . . Yes, it really is time for the WHL to add an award to its roster, one named in Kennedy’s honour, one that would go to a WHL grad who is making a difference. I would suggest that the next head coach of the Vancouver Canucks rent and not buy green bananas. Yes, Willie Desjardins, who was fired as head coach on Monday morning, deserved better, but such is the nature of the beast. The two men responsible for the roster, Trevor Linden and Jim Benning, provided Desjardins with a hodge-podge of players with which no one could have won. Then, when the season was over, Linden and Benning tsk-tsked and said all the right things, while Desjardins was kicked out the door. In truth, a coaching staff comprising Scotty Bowman, Toe Blake and Joel Quenneville couldn’t have brought that roster home any higher than 29th. One more thing about the Vancouver Canucks — it won’t be much better, if at all, next season. Unfortunately, the Sedin twins are a year past their best-before date and their ice time needs to go to younger players. But that’s not likely to happen before 2018-19. . . . Hey, Canucks fans, just don’t go having a drink every time you are told to “be patient” over the next two years. I don’t know what it means, if anything, but the Vancouver Canucks, under the ownership of Francesco Aquilini, and the Dallas Stars, who are owned by Tom Gaglardi, both fired their head coaches after failing to make the NHL playoffs this season. You may recall that Aquilini and Gaglardi once were part of a triumvirate, with Ryan Beedie, that hoped to purchase the Canucks. Aquilini went rogue and purchased the franchise on his own. Gaglardi sued, lost, and ultimately purchased the Stars out of bankruptcy. Unfortunately, things haven’t turned out the way either man had hoped. A lot of observers have Travis Green pencilled in as the next head coach of the Vancouver Canucks. After all, he is the head coach of their AHL affiliate, the Utica Comets. But why not Mike Johnston, who is in his second go-round with the WHL’s Portland Winterhawks? Yes, he was fired by the Pittsburgh Penguins, but he had a 58-37-15 record with them. Oh, he also owns a home in Blaine, Wash., which is just a slapshot from Vancouver. There now are five head-coaching vacancies in the NHL. Gotta think Ken Hitchcock gets one of them. A year ago, the Florida Panthers were seen as one of the NHL’s top, young teams. Then someone decided to juggle the deck chairs and now they’re a mess and out of the playoffs. Dale Tallon was in charge, then he wasn’t, now he is. But the scouting staff that had such a good track record is gone now, and there’s isn’t a head coach. It will be interesting to see how long it takes to put this Humpty Dumpty back together again. Olten (Switzerland, NL B) has announced that F Codey Burki (Brandon, 2002-07) has retired. Burki hasn’t recovered from a concussion suffered in practice in October 2015 and hasn’t played in a game since. In 2015-16, he was pointless in three games. . . .
F Petr Stoklasa (Tri-City, 2007-09) has signed a one-year extension with Val Vanoise Méribel (France, Division 1). This season, in 24 games, he had 13 goals and 18 assists. He also was the team captain. Derek Laxdal, a former head coach of the WHL’s Edmonton Oil Kings, will return for a fourth season as head coach of the Texas Stars, the AHL affiliate of the NHL’s Dallas Stars that plays out of Cedar Park, Texas. . . . Laxdal signed a three-year contract prior to the 2014-15 season. Although there is no news on a new deal, the organization has confirmed that he will return. . . . The Stars are 112-83-30 under Laxdal, although they won’t make the playoffs this season. After a 3-1 loss to the Charlotte Checkers on Sunday, they are 32-36-5. . . . Laxdal spent four seasons (2010-14) as head coach of the Oil Kings, winning two WHL titles and a Memorial Cup. Edmonton won at least 50 games in each of his last three seasons. In the four seasons, the Oil Kings were 182-83-23. Red Berenson has retired after 33 seasons as head coach of the U of Michigan Wolverines. He had an 848-426-92 record and won national titles in 1996 and 1998. . . . This season, the Wolverines were 13-19-3. . . . Berenson, 77, is a native of Regina. He played two seasons (1956-58) with the Pats, who then were in the SJHL, before playing three seasons at Michigan. He followed that with a pro career that ended after the 1977-78 season. He coached six seasons in the NHL before taking over as the Wolverines’ head coach for the 1984-85 season. . . . Berenson will remain with Michigan as an advisor to the athletic director. The Washington Capitals have signed F Beck Malenstyn of the Calgary Hitmen to a three-year entry-level contract. He was a fifth-round selection in the NHL’s 2016 draft. From Delta, B.C., Malenstyn had career highs in goals (32) and assists (24) this season. MORE ON THE MOVE: The Prince George Cougars now have five players off the roster in the AHL with F Jesse Gabrielle having joined the Providence Bruins. Gabrielle signed a three-year entry-level contract with the NHL’s Boston Bruins in December. . . . Other Cougars in the AHL are F Radovan Bondra (Rockford IceHogs), D Brendan Guhle (Rochester Americans), F Jansen Harkins (Manitoba Moose) and F Colby McAuley (San Jose Barracuda). These four all played AHL games over the weekend. . . . Meanwhile, F Adam Musil of the Red Deer Rebels has joined the Chicago Wolves, the AHL affiliate of the NHL’s St. Louis Blues. Ryan Miller, a former NFL offensive lineman, is working to piece his life back together. Nicki Jhabvala of the Denver Post writes: “Miller, 27, is finally speaking out about his tears, his migraines, his memory loss, his seizures, his depression, his anger, his compassion and, now, his hope. Almost two years after he was diagnosed with post-concussion syndrome (PCS), he’s finally finding his way back to normalcy, or as close as he can get to it.” . . . Miller also has received help from former WHL enforcer Scott Parker and his wife, Francesca, who have started an organization, Parkers Platoon, that, Jhabvala writes, “was developed to help veterans, athletes and others cope with the symptoms of PCS and traumatic brain injury.” . . . Jhabvala’s complete story is right here. 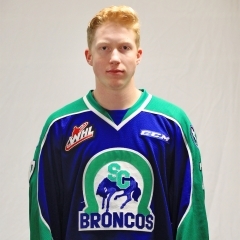 #WHL #REGvsSC: @SCBroncos Colby Sissons is team's first defenseman to score playoff game winning goal of any type since Ian White, 3/23/04. was the second OT game of the series. The Broncos had won Game 1 on Thursdsay, 2-1, on a goal by F Ryley Lindgren at 15:12 of extra time. . . . Last night, Sissons gathered the puck in his zone and skated it up ice before firing a 56-foot wrist shot that beat G Tyler Brown through the legs as he was going to the ice. . . . Sissons, who turned 19 on Jan. 15, scored six goals in 63 games in the regular season. He has two goals in 10 playoff games. . . . F Dawson Leedahl’s fourth goal of the playoffs gave Regina a 1-0 lead at 3:03 of the second period. . . . The Broncos tied it at 5:10 when F Conner Chaulk, who is from Regina, scored his first goal, on a PP. . . . Sissons won it with the only shot by either team in OT. . . . Geoffrey Brandow noted on Twitter that Sissons is the first Swift Current defenceman to score an OT goal in a playoff game since Rocky Thompson beat the host Red Deer Rebels, 3-2, on April 4, 1997. . . . The Broncos got 33 saves from G Jordan Papirny on his 21st birthday. . . . Brown finished with 31 saves. . . . Swift Current was 1-4 on the PP; Regina was 0-2. . . . The Broncos were without F Mackenzie Wight and he also will miss Game 4. He was hit with a two-game suspension under supplemental discipline, having been held responsible for the hit on which Regina F Adam Brooks was injured in Game 2. . . . Brooks, with 250 points and a WHL scoring title over the past two seasons, made the trip to Swift Current with the Pats, who also were without F Filip Ahl for a second straight game. . . . Regina dressed F Kjell Kjemhus, 15, and had F Duncan Pierce back after he missed five weeks with a hairline fracture to an ankle. . . . With Wight gone, the Broncos put D Dom Schmiemann back into their lineup. . . . Announced attendance: 2,890.